Beginning January 1, 2019, rates are increasing for the first time in over a decade, with 100% of rate increases going toward an exclusive fund for recreation facilities. This means recreation projects don’t have to compete for funding with other citywide projects, so your investment goes directly toward the recreation amenities you know and love. The first two projects benefiting from this new recreation fund are the future Dublin Community Pool North renovation and a refresh of the Dublin Community Recreation Center interior. Proof of residency is required to receive City of Dublin Resident rate. All guests are required to present a state, school, or City of Dublin picture ID prior to passing through the Check-In Desk. Guests 10-17 years old may request to have an ID issued at the Welcome Desk when accompanied by a guardian with proper identification. The City of Dublin reserves the right to refuse entry to anyone registered as a sexual offender (Resolution 6-13). A valid photo ID is required for all membership/pass sales and renewals. Annual memberships are available to families and individuals living in the same household. A current utility bill, current City of Dublin Resident Card or valid Ohio driver’s license is required as proof of residency at the time of application or renewal. Proof of age is required for children ages 2 years and under (birth certificate) and for adults over 60. Household members under age 18 must have a parent or guardian complete the membership application. Household members 18 or older must sign the application and provide proof of residency. Upon enrollment, you are issued a DCRC photo ID or key fob. This DCRC pass must be presented to enter the facility. There is a $25 reinstatement for memberships renewed within one year of termination. Electronic Funds Transfer is available for annual memberships (except College Student). The first month’s fee is due at time of purchase. Money is drawn from a designated checking or savings account for 11 months thereafter, between the 15th and 20th of every month. A voided check or savings documentation with account and routing numbers is needed at time of purchase. (The second rate listed is the monthly payment that is drafted 11 times a year for an annual mem-bership). There is a $1 per month fee for this service. All annual members receive a 10 percent discount for all Recre-ation services programs held at the DCRC that do not already reflect a membership discount (i.e. aerobic passes). Dublin City Council recognizes that the facilities and programs offered by Recreation Services should provide beneficial pricing and priority to the residents of the City. City Council’s current financial policy is to keep fees for residents participating in recreation classes and other recreational amenities at a moderate level. These financial policies have been implemented to benefit residents and to encourage a healthy community. School District Residents and Non-Residents do not receive the tax-subsidized pricing received by the residents of the City of Dublin. Fees for recreation center annual passes, seasonal passes and program registrations are determined by where people live. You are considered a City Resident if you reside within the City of Dublin corporate limits. School District Residents reside in the Dublin School District, but not within the City of Dublin corporate limits. Anyone not fitting into one of these two categories is considered a Non-Resident. Your mailing address or school district is not always an accurate indication of your City of Dublin residency status. You may research your residency status at https://dublinohiousa.gov/taxation. Two regulation bocce ball courts are available for public use, subject to senior adult programming and league play. Bocce ball sets may be checked out at the Welcome Desk by players 18 and older. The classrooms house a variety of programs, including pottery and arts & crafts—meeting the needs of preschoolers, children, teens, adults and senior adults. The Community Hall provides space for parties, receptions, meetings and community events. The facility seats up to 300 or can be divided into smaller rooms. A 200-seat theater can be used for musical, theatrical and dance performances; film/video; lectures; and seminars. Equipped with workstations and a variety of software programs, the computer lab provides high-speed Internet access and opportunities for beginning and intermediate instruction. Open to ages 18 & up. Each family locker room has its own shower, restroom and lockers. One locker room, designed for people with special needs, features a dressing table. Looking for free weights and cardiovascular equipment? Check out the fully equipped fitness area on the first floor. You will find treadmills, elliptical machines, bicycles and stair steppers along with free weights, Nautilus and a complete set of Cybex strength equipment. If you enjoy group fitness, check out the myriad of classes offered. Two state-of-the-art studios feature suspended floors to help reduce impact and injury. Several pass options are available, allowing participants to choose from a weekly schedule of classes that include Spinning®, Pilates and TRX. Joggers and walkers on the second floor track can cover a mile in 13 laps. An expanse of windows provides views of the pools and the outdoors. The competitive/lap pool measures 25 yards by 25 meters and has two one-meter diving boards. This pool often is divided for activities such as aqua aerobics, open swim, swim team practice and instruction. Bleachers provide ample seating and a separate entrance makes it perfect for area swim meets. The natatorium walls in both the lap and leisure pools are lined with sound-absorbing material. A unique feature of the DCRC is the leisure pool, which includes a lazy river, clam slide for children, double helix slide for those a little more daring and a zero-foot entry point for cautious tots. The warmer water and 3.5-foot maximum depth make this pool perfect for children, adults and senior adults. An elegant, cozy lounge welcomes senior adults to our center. Enjoy playing cards with friends, reading by a fireplace or simply relaxing in this peaceful environment. A teen lounge offers space and a variety of programming opportunities for Dublin teens. While moms and dads are working out, attending a class or relaxing in the hot tub, they can rest assured that their children—from ages 6 weeks to 12 years—are nearby and safe. Children can play in the indoor or outdoor area or engage in age-appropriate games and activities. Proper and valid identification is required to gain access to the DCRC. 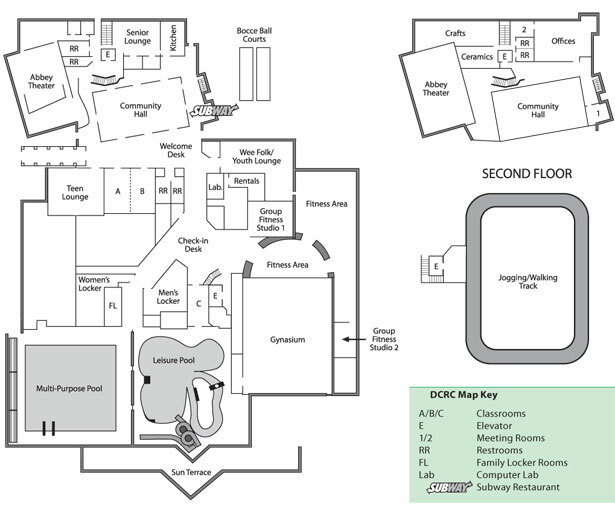 Users of the DCRC need to check in at the front desk and provide annual pass, resident card, temporary pass or pay the daily pass rate for admittance. Annual pass holders who do not present their annual pass will only be admitted if an alternate form of photo identification is produced. Resident card holders must present their Dublin Resident ID card each visit to receive the daily pass discount rate. Annual passes are not transferable and will be deemed void when in the hands of those other than the proper registrant. The DCRC and its grounds are smoke- and alcohol-free environments by City ordinance. Eating and drinking is permitted in designated areas only. Children ages 9 and under must have adult/guardian at least 16 years of age supervising at all times. Supervising adults must keep children ages 4 and under within arm’s reach; there must be at least one adult for each two children in this age group. Children ages 5 through 7 must be within sight of their attending adult at all times. Children ages 8 and 9 must have an adult in the facility at all times. For children ages 5 through 9, there must be one adult for every five children. Children ages 10 years and over may enter the facility without an adult supervisor. Youth must be 16 years of age or older to be on the fitness floor. Youth ages 12 – 15 years are permitted on the fitness floor if directly supervised by an adult or if they have passed the Junior Fitness Card Program (see Fitness Program Section). Youth under the age of 12 years are not permitted on the fitness floor area at anytime. Youth must be 13 years of age or older to be on the track or in the track stretching areas. Youth ages 8 – 12 years are permitted on the track if directly supervised by an adult or if they have passed the Junior Track Program (see Fitness Program Section). Youth may enroll in the Junior Track Program if they are ages 10-12. Youth under the age of 8 years are not permitted on the track at anytime unless utilizing the pool observation area with an adult. Changes in recreation schedules may occur without notice. Staff will post changes in the schedule with as much advance notice as possible. Current pool, aerobics and open gym schedules are available at the Front Desk. Dublin Recreation Services is not responsible for lost or stolen articles. It is strongly recommended that you lock your possessions in a locker during your visit to the DCRC. Lockers are available on a first-come, first-served basis. Locks may not be left on lockers overnight. Locks which are left overnight will be removed by staff. Permanent suspension from use of the facilities upon any subsequent incident. The City of Dublin Parks and Recreation Department offers a variety of programs for all ages. The City strives to make these programs accessible to all its residents. Therefore, a financial assistance program is available for those who would not otherwise be able to afford to participate in these programs. Download Financial Assistance Program Guidelines and Application Form.